Q-Dispatch makes it simple to connect all your marketing channels and monitor each campaign’s success. Assess your results and develop winning marketing strategies. Referrals keep your schedule full. Don’t let them slip away. Q-Dispatch helps you track, nurture, and schedule referrals in a way that makes them feel like VIPs. They’ll be more likely to schedule and buy. Receive leads from your source, all directly in to your calendar. Enjoy how simple lead work can be. Discover your target market by seeing who’s checking out your site. View the demographics of your visitors to better pinpoint marketing efforts. Why waste time pressing numbers when your software can predict who you’re calling? Spend more time marketing and less time searching. Create canvassing teams and assign them to promising locations. Track their results in real time. Keep contact information organized in the call center and put the power of communication at your fingertips. Pull up a past call in a flash. All calls through our software are recorded and saved for your convenience. 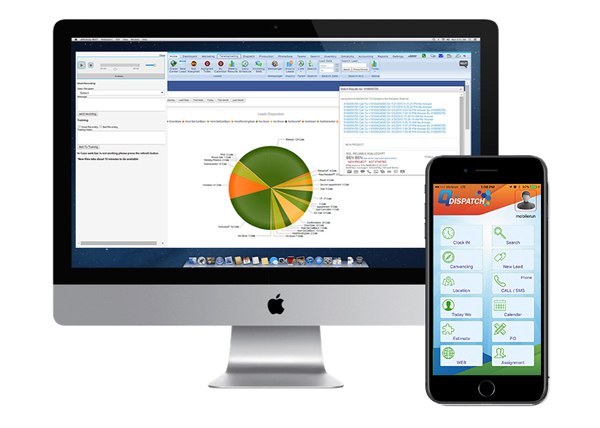 Receive and perform outbound calls with our software or someone else’s. Experience clear sounds and communication so you can schedule calls with confidence. Message anyone within your company without hassle. You can set up team messages or send a blast out to the entire company. You’ll always be able to communicate important messages, ideas, and emergencies to keep your team ahead of the game. Never miss an important incident. Be notified immediately of issues or concerns and handle them like a boss. Stay informed by sending and receiving reminders and updates through text, both to and from clients, techs, and sales reps.
Compose effective email campaigns and track their success rates. Discover the perfect combination of words that compel action. Prevent breaches and protect your clients’ information and internal data of your company. Sleep better knowing you’re always protected. Don’t let your software tell you how to manage your business. Integrate your style seamlessly into our software and stay in control. Build your own lead forms and use them to create new leads in the office or on the go. Lock up leads by assigning them to their best match. Experience what it’s like to breeze through your lead list and expand your client list simultaneously. Keep track of efforts to convert leads. Look for trends that help you decide what marketing works. Gain a visual of your lead assignments through the lead disposition feature. Never wonder which team member is covering a lead. Gauge the progress of lead disposition through accurate tracking. Know which team members are closing the deal and which are still in the nurturing stage. Allow your software to double as a map by providing pinpoint GEO location accuracy. What good is a calendar that won’t let you customize based on your needs, preferences, and schedule? Customize and manage your calendar better than a personal assistant could. Is your lead list drying up? Expand it by exploring your inquiries. Find out what makes them tick and provide them with a solution they can’t forget about. Have a direct view of the field, even when in the office. Know the exact location of every tech and team member without doubting accuracy. Manage the sales process from the moment you make contact until the contract is signed. Boost sales by showing technicians exactly what they can expect through commissions. Inspire and encourage them to look into every opportunity. There’s no lag in our reporting. You’ll always have up to date information that helps you make smart decisions. One centralized calendar will keep you organized and productive. View the company’s overall schedule or an individual employee’s. Need to know something before it happens? Our notifications and alerts feature is the closest thing to a crystal ball. You’ll always know what’s going on. Need to assign an appointment to a tech? Simply choose an appointment type and place it in the appropriate slot. Utilize the easy assignment feature for accuracy and time saving capabilities. Amend and review files as needed. No matter the type of file you’re trying to open, Q-Dispatch can help you access it. Extract important phone call information as needed through call recording. Every word is safely stored within your data for future review as needed. Discover a reliable phone service through VoIP. Already have a provider you love? Use it with Q-Dispatch for premium results. Whether there’s a crisis in the field or you need a quick answer to a question, the internal messaging feature provides the solution. Send out messages to the team as needed or set up automatic messaging to clients letting them know tech arrival times or appointment updates. Balance sales and nurturing through email marketing. Find the perfect model for clients, leads, and inquiries. Find the status of every appointment on the books. Whether it’s scheduled, in progress, or complete, you’ll be on top of it. Track incoming parts and/or jobs with our order tracking feature. Schedule appointments correctly and never waste time trying to track down the status of an order. Your team’s mobile devices automatically become GPS trackers. Know where everyone is at all times to boost productivity and provide accurate service time quotes. Never have to wonder if your reports are accurate. Data is automatically updated so that everything is always current and beneficial. Keep track of all your clients in one convenient screen. Have fast access to phone numbers, emails, addresses, and personal notes. All your clients will think they’re your favorite! Clients can log into your site at their convenience. Allow them to make payments or schedule appointments at their leisure. Just because your office is closed doesn’t mean business can’t keep rolling on. Ditch the Post-Its and create digital notes that will remind you of crucial information, whether it’s regarding a client, order, or team meeting. Do you love QuickBooks? So do we! We’ve designed our software to easily integrate with QuickBooks, making it easier to get your financial work done. Receive payments without fear. Clients will feel confident entering payment information while you receive what you’re owed for a job well done. Draft up contracts in an instant. When it’s time to sign, you can rest easy knowing that all the legal requirements are under control. Curious where an order is? Get up to date information with a few clicks with our tracking feature. Assess the status of any order, any time. Develop flawless projects with our project management feature. From conception to finalization, everything will run smoothly and efficiently. Show your professionalism and reliability through prospect management. Nurture relationships in an authentic manner that makes you look like the hero. Kiss error pop-ups goodbye. Files upload the first time, every time. With Q-Dispatch, even the less than common file types aren’t an issue. If your current calendar system isn’t working, our multi-calendar feature will help. Have separate calendars for different departments of your business so you can keep it all organized. Accelerate tasks without missing a beat. For the tasks that take more than a single step, manage each portion until it’s complete. Expedite tasks by making sure none get left on the table. Our task assignment feature will ensure everyone in the office is taking proper action in a timely manner. Retain control by knowing when something big happens in the office. Neutralize the negative and reinforce the positive. Prefer an email alert over a message? We’ve got you covered. Get your alerts the way you want with email alerts. Don’t let working capital go to waste with improperly managed inventory. Make sure your numbers are always accurate with inventory management. Simple contracts don’t cut it. When you need to customize based on unique client needs and job details, our custom contract feature is exactly what you need. Utilize the power of VoIP powered by Q-Dispatch. Whether you have a provider already or need a little help, our VoIP tools can start the conversation. When something big happens, share it with the team instantly. Focus on fixing an error or reward them for a job well done. Send texts to crew or clients with ease. People might not answer a call or open an email, but you can almost guarantee they’ll read a text. Get your message across. When done properly, email marketing can work wonders. But if it’s not done right, you could be damaging your brand. Track your email marketing efforts and protect your image. Protect personal and important data with Q-Dispatch. Our data security features provide you with a virtual security guard that won’t let anything slip through. Prescribe your ideal management tactics and put them to work. Every business is different, and their management processes should be as well. We won’t hold you back. Build custom lead forms that capture the information you need to nurture and build relationships that are sure to turn into more. Retain your financial information and processes through QuickBooks integration. Use the features you love and combine them with the power of Q-Dispatch. Easily track employee time with an accurate time clock system. Even if team members head out into the field before the office, you’ll be able to track and pay them accordingly. Don’t be left behind in the technological era. Our facial recognition feature will ensure log ins are accurate and only the proper information is being accessed by an employee. Don’t let the numbers take you by surprise at the end of the day, month, or year. Stay on top of financial gains so you can make wise choices and stop downhill spirals before they get out of control. The dashboards tab will help you generate all sorts of custom reports. No matter what you’re curious about, there’s a report to give you an answer. Keep track of all your marketing channels and results. Learn in your custom report what’s working and what needs work. See how your sales team is performing by analyzing your phone sale report. Know who’s your best sales team member and who could use a bit more training. Make sure everyone on the team is set up for success. Track messages sent to see which were responded to. Tweak messages for better response rates. Make sure sent messages were received and acted upon. Reports can be split up by sender or day. With all your clients’ information stored in one place, you’ll be able to easily access it as needed. Create custom reports to sort clients by location, date last serviced, or as needed. Keep track of order numbers, costs, and dates. Plan inventory smarter and easier. Keep track of submitted and signed contracts. You’ll always be protected when working only under contract. Connect mobile devices to your computer with ease. If you have the technology waiting for you in your hands, why not get the most out of it? Discover marketing tactics that work for your business, services, and location through the marketing manager feature. Run reports that help you boost marketing. Handle the impossible with the dispatch manager feature. No matter how many appointments, techs, or emergencies are on the calendar, handle it all with grace and style. Monitor and manage IT infrastructure based on your unique services. Every concept, word, and idea you put out in the world from your business is managed through Q-Dispatch. See how your message is getting across. Manage installations and updates with ease. Never worry about crashing or technical issues. Is your time spent in the field being wisley utilized? Make sure that every minute in the big open world is being used with your best interests in mind. Who just called? You always have the answer with the call log feature. Look up yesterday’s calls, calls from last week, or track down the number of a lead you promised to call back. Know which of your agents are rocking out the calls and which need a little motivation. Manage expectations and track results. Gauge how many services and the amount they ring up for with ease. Know if you’re under or overcharging and customize your menu to suit client means. Make sure appointments are invoiced for and on time. Don’t drop the ball during the last step of the process. Make sure your sent-out invoices match the work you’ve completed over the past day, week, or month. Avoid mistakes that cost your bottom line. Make sure that new appointments aren’t being missed by utilizing the reload option. See a refreshed schedule with one click. See how far your referrals are taking you with a monthly results report. Use results to help determine new canvassing and lead generation options. Discover the exact amount of estimate work orders placed so that you can get an idea of upcoming schedules. Learn how much service work orders were completed so you can see where business improved and where you can do more. What were you best projects? Project work order results will show you and help you discover your business’ signature work. Stay on top of the numbers with the sales dashboard. You’ll be up to date on sales over the phone, in the field, and in total. See how your efforts have paid off in canvassing. Know how many potential leads and new clients were obtained so you can fine-tune your approach for even more impressive results. Make sure invoices are being paid and on time. See how your payments stack up against your sales. Access all past and current invoices. Know if a client is behind on payment or who pays right away. Keep track of your employees’ working hours no matter what tracking software you use. Q-Dispatch features integration at its best. Ensure privacy and employee accuracy with facial recognition software. Allow clients to pay online with their preferred method. Don’t let closed office hours slow down your cash flow. Gain full use from your business credit card through Credit Card Profile. Add credit cards and use them as needed throughout the day with simplicity and ease. Use current mobile devices for accurate GPS tracking. Even when you’re comfortable at the office, you’ll know what’s going on in the field. Use the calendar function as you see fit. If a single calendar just won’t cut it, make calendars for everyone in the office, just for certain branches, or based on appointment types. You’ll always know what the day holds. Be notified of all things business, both good and bad. You’ll always be one step ahead. Access the Q-Dispatch system without having to jump through hoops and blow whistles. We want you to love our software, so we’ll never keep you from it. Need a file? No problem! Q-Dispatch can send and upload all types of files. Don’t let technology slow you down. Remotely track and monitor all messages. See if there’s a better time or phrase to use in your marketing messages and make sure employees are checking in. Always have data to back up your imperfect memory. With call recording, you can review past calls with clients, employees, and merchants. Simplify phone calls with VoIP. Whether you have your own service or prefer to use ours, we have the tools you need for experiencing flawless calls. Have something to say? Let everyone on your team know in a matter of seconds. With reliable internal messaging, the message always gets out. Preserve relationships with clients through SMS messaging. Reach out to new clients, send appointment updates, or spread some marketing cheer through messaging. Distribute the latest news, offers, and updates through email marketing. Send out a massive mailing or target a specific list for improved marketing efforts. Observe appointments without getting in the way through the status tracking feature. Know if an appointment has just been started, almost complete, or next in line. You’ll never be in the dark again. Improve your current reporting tactics with real time reporting. You’ll always have the most up to date information, empowering you to make smart decisions.